Kazuki Shikimori is a High School student who attends Aoi Academy, but for someone like Kazuiki, who isn’t what you would call an exceptional student, it’s a wonder he got into Aoi Academy in the first place. Not only that, but he can only use magic 8 times during his life in a world where most people can use magic into the double digits (and sometimes more for the Aoi Academy students). However, it wasn’t luck that brought Kazuiki to Aoi Academy, but his genes, which he soon finds out about. He has a history of some of the greatest magicians in history and now all of the girls are after him for his genes! 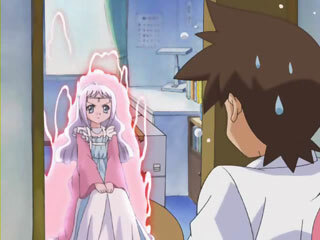 After meeting Rin, Yuuna, and Kuriko, who were the first after his genes, results in the whole school, and himself, finding out about this surprising turn of events and so beginning the highly humorous series of Maburaho. Maburaho was a very fun anime with tons of humor, a little etchie-like stuff, and interesting characters. The storyline is simple enough so that you can easily start enjoying the show, and there wasn’t one episode that didn’t provide some amount of humor. The one and only big problem about the humor though, is that there are a couple episodes where they will have you on the verge of tears, trick you for a while, and then turn everything into a joke. However, it wasn’t really a bad thing, because it makes this anime so unpredictable, which only adds to the enjoyment of the whole series. Maburaho seems to develop and end various goals throughout the series and has no definite goal that lasts the full series. However, this series wouldn’t be considered a bunch of filler episodes at all (filler episodes, as in a new goal every single episode with no main goal). As for the characters, they all have very unique personalities, which seem to change a little every so often throughout the series. All of the main characters were very interesting, making Maburaho the great anime that it is. I wasn’t all that thrilled with the graphics, being only average compared with most animes. They are far from bad, but there is nothing amazing about them. Anyways, other than the graphics just being average, there wasn’t really anything wrong graphic-wise and the shadows and what not were great. All of the sound affects were very good, nothing extraordinary, but still above average. Most sound affects were realistic or at least pertained to the event where you heard them very well, so I was not disappointed at all. As for the music, it was great. All of the tunes were very fun to listen to and pertained to the whole series in general very well. Not much more I can say since the music was wonderful and I have no negative criticism towards it. 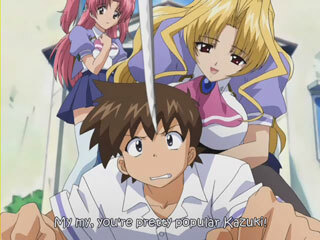 Overall Mabruaho was a highly entertaining anime that is a definite buy. It is something that I could probably watch more than once, and it was very humorous throughout the anime without turning the storyline inside-out. Anyways, unless you are anti-humor, I think there is something in this anime for everyone.